Netflix has been huge in 2017 for their scripted television programs, but you know that they want more than that. They have been releasing movies all year too, in a varying degree of success, looking to become a force in the world of cinema. The next step in that attempted evolution of the streaming service was Bright, the new film by Will Smith and Joel Edgerton. That is two big names in the world of movies (not Adam Sandler and his latest travesty) and there were high hopes that this might be the film that put Netflix into that next level. Not only do you have Smith and Edgerton, but the film is written and produced by Max Landis, who just had a hugely entertaining series based on the Dirk Gently book. Sounds as if the film was going all in. Unfortunately, Bright was not the epic film that Netflix had hoped for. It is not bad and it certainly has its share of positives, but the fact is that this is nowhere near the tent pole film that Netflix had hope it to be. Will Smith played police officer Daryl Ward who, despite his own protests, had been assigned the world’s first Orc police officer, Nick Jakoby (Joel Edgerton). The fantasy world was filled with Orcs and fairies and elves. It felt like the world of Dungeons and Dragons held in Los Angeles. After recovering from being shot, Ward returned to work among whispers and hatred for Nick. Ward would tell anyone who would listen that he did not want to have Nick as a partner and he tried everything to get rid of the Orc. What Ward did not know was that a powerful magical artifact had turned up in the city and that mystical forces were arriving to try and reclaim it. Ward and Nick got sucked into the search and found themselves at the center of the problem. My biggest issue with Bright is that it tries to do too much, so most of the story felt crammed into the film. It tried to set up too dense of a mythology for the two hour run time. While I appreciate the attempt to include such fantasy creatures as it does, there was overkill with all of the different races. This felt like it would have been more fleshed out as a Netflix original series. If Bright had six-eight episodes, I feel that there would have been some really great storytelling happening here. Will Smith was his typically great self, bringing the most he could to the role. The connection between Ward and Nick was a tad forced and made it more difficult to accept this as the buddy cop movie that it was intended as. I also thought that, though his performance was solid, Joel Edgerton’s character of Nick was all over the place and too inconsistent to be effective. Edgerton was good for what he was given though. The film looked great, with some solid effects and some exciting action scenes. Admittedly, there are probably too many gun fights, and there were too many scenes that felt like the conclusion of the Suicide Squad. David Ayer directed Bright and you could see his touches throughout the film. I did very much enjoy the opening musical montage scene where the camera moves around the city seeing the graffiti on walls, telling you stories of the creatures in the world. That worked very well. And seeing Will Smith kill a fairy with a broom was a great scene. 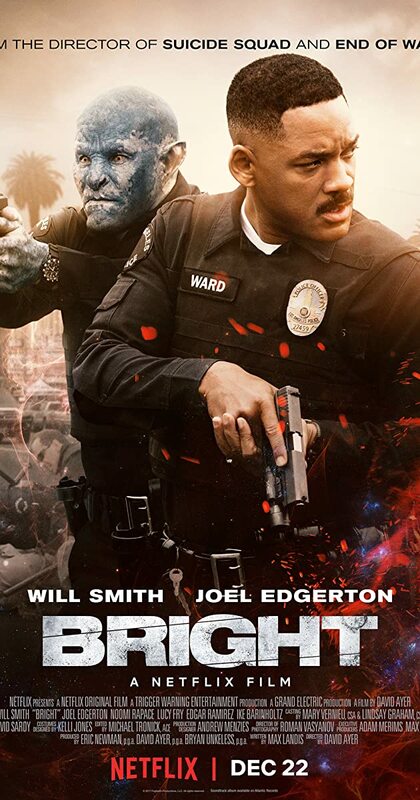 Bright was an uneven film that had some solid work, but also had too much mythology for its time and some questionable choices. Still, it isn’t the worst films you can watch on Netflix (Hi Adam Sandler). It just is not the next huge hit.